Recently I’ve become inspired to create a multitude of new pages and blog posts for our All in Web Pro website to add a wealth of new content to our site to bring helpful information to our clients and site visitors, as well as to boost our ranking in Google searches. This week after publishing several new blog posts in a row I wanted to double check our sitemap.xml file to make sure Google & Bing had the most up to date list of all of our old and new webpages. We’d been using a WordPress plugin called “Google XML Sitemaps” which had worked for us in the past and is designed to automatically update the sitemap.xml file anytime a page or post is created or updated on your WordPress website. This is important because you want all of your new webpages to be announced to search engines as soon as they’re live on your website. And although search engines automatically rescan your website to look for new content and pages, submitting it to them directly can speed up the process and help those pages get indexed and seen by search engine users faster. So after checking our sitemap.xml file that the Google XML Sitemaps plugin was generating, I noticed the blog posts I’d submitted a week earlier weren’t appearing. I’m going to update our WordPress core and activate the plugin to see if it will start working again. But in the meantime I needed a way to update our sitemap quickly and manually to make sure it’s appearing correctly with all of our links. Which is where the following short tutorial on how to update your sitemap.xml file begins. What is a sitemap.xml file? A sitemap.xml file that sits on your website’s hosting server which tells search engines all of the pages on your website that exist, what priority you rank the pages in, when they were last updated, and how frequently you update them. This information helps Google & Bing know how often to rescan your website’s pages for updates and which pages on your site are more important to show in search results. It’s also a good way to announce the creation of new pages on your site to Google & Bing. The file is written in XML, which is similar but different from HTML, another type of “Markup Language, which is what the “ML” are abbreviations for. So it’s important that your XML file is created correctly with no errors in the XML format. Why is my sitemap.xml file so important? If you want to have the best chance of showing up on the first page of a Google or Bing search when your potential customers or audience are doing relevant searches you need Google and Bing to know all of the pages on your website, which ones are the most important ones you want appearing, and also to include your most recently created content. If your sitemap is not up to date it will tell search engines that maybe your website isn’t being updated and therefore might not have the most relevant and current information on it. Many other factors are taken into consideration, but when you know sitemaps have an impact on your search rankings and are an important part of SEO, why not be safe and make sure it’s correct?! There are several websites you can visit to generate a sitemap file for your website. 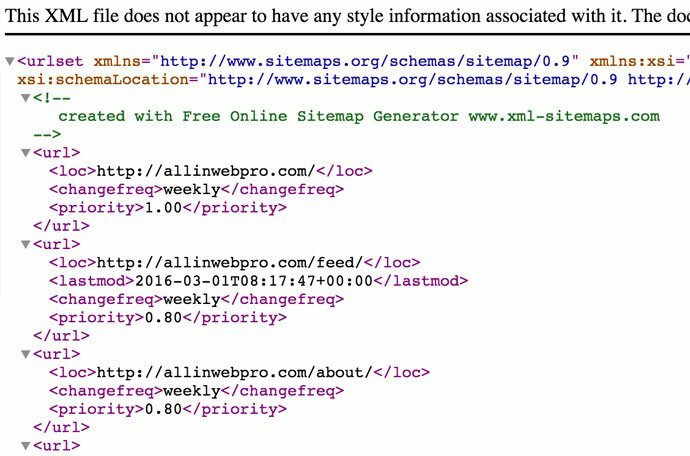 I did a Google search for “sitemap generator” and found XML-Sitemap.com which worked well. Just enter your website URL and download the free files generated. The file we need is sitemap.xml. To get your sitemap.xml file onto your website’s hosting server you’ll need one of the following 2 things. 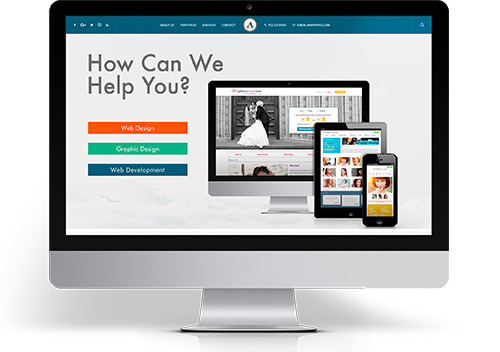 A) The login & password to the hosting control panel for your website so you can utilize a file manager tool that your web hosts provides to upload the sitemap.xml file to your website’s root (/) folder. B) You can download a free FTP (file transfer protocol) program to your computer, such as FileZilla, which will enable you to upload files directly to your website’s hosting server. You’ll still need to have an FTP user account created on your hosting account, which will have a username & password along with a hostname. For hostname you can usually just type your website domain name (e.g. allinwebpro.com), otherwise you can use the IP address of the web host server where your website’s files are located, which your hosting company provides you. The sitemap.xml file should be uploaded to the root folder of your website. This is usually the folder labeled ‘/’, and is also usually the same folder where you’ll find usually also see the ‘index.php’ and ‘.htaccess’ files. Now go to your website and add the ‘/sitemap.xml’ suffix to your website’s domain name, like this: ‘www.mydomain.com/sitemap.xml’. If the page you see looks something like this then it worked! Both Google and Bing have an advanced Webmaster Tools service where you can create an account and manage all of the different websites that you administrate. You’ll need to verify that you control your website by following their verification instructions, which usually involves adding a snippet of code to the header or footer of your homepage. Once verified you can navigate to the ‘sitemap’ area of Webmaster Tools to submit or resubmit your sitemap.xml file. Both search engines have advanced tutorials and help information to help you complete this task, and both provide advanced reporting tools to let you know more about your website including any broken links, or how many pages are currently indexed vs what was submitted. Although this method works, it is a little time consuming and it would be much easier to simply upload a plugin to your WordPress dashboard that would automatically update your sitemap.xml file anytime changes were made to your site. I’m going to do some plugin tests and see if any are reliable and will update this blog post accordingly. But it’s helpful to know how to manually create your own sitemap.xml file in the event that plugins become buggy or aren’t picking up all of the links to your site, especially if you start using a subdomain which may be tricky for some automated plugins to read. What Sitemap Tools Do You Use? Please comment below if you found this sitemap.xml guide helpful, or if you have other websites, plugins, or tools that worked well for you.